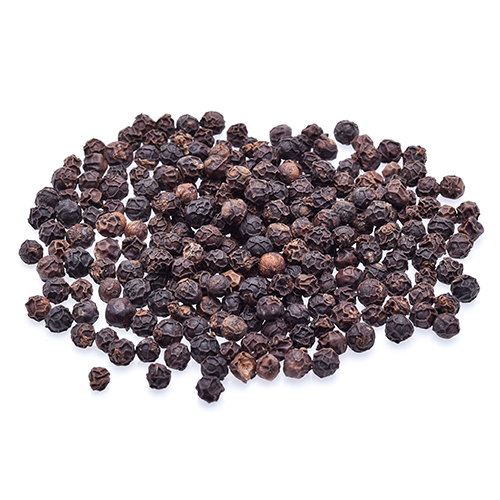 Black pepper is native to south India and is extensively cultivated there and in other tropical regions. The fruit of the piper nigrum vine is dried and used as a spice and seasoning ”“ this is the black pepper most of us are familiar with. The dried fruit is known as peppercorn. Black peppercorns, more commonly called black pepper, dramatically enhance the taste of your dishes ”“ and their health quotient too. We so often use salt in our dishes that black peppercorns often lie forgotten. In ancient times, black pepper was considered the “king of spices” and it was more valuable than gold. One’s social standing was even measured by how much black pepper was owned by the household. Today Black pepper is perhaps the best-loved and most widely used spice in the world, adding both heat and depth of flavor to nearly any dish. After salt, pepper is the most frequently used spice in the world. It is an ingredient that is found in almost every savory (not as many sweet) recipes and it can be found on every dinner table in America. From a culinary standpoint, black pepper’s uses are almost endless, but some traditional suggestions include coating meats with crushed peppercorns; adding pepper to warm beverages such as chai tea; sprinkling on freshly cut fruit for a spicy kick; and grinding pepper into a bowl of olive oil with balsamic vinegar to create a dipping sauce for bread and vegetables. For the best flavor, choose whole peppercorns that you can mill before adding to dishes. Sowing pepper seeds can be done, but only fresh seeds are germinated, seeds are viable for very short period. The pepper plant loves extremely humid climates where temperatures never fall below 60 F (16 C). Pepper fruit is harvested before maturity and dried in the hot sun. After drying it becomes wrinkled and black.